In 1950s and 1960s, Smoke Control Areas were introduced in many large towns and cities to tackle the widespread pollution emitted from domestic and industrial buildings. The local authorities were given power to control these emissions and to ban the smoke emitted from these buildings. 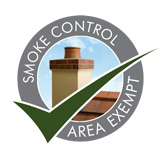 If you live in a large town or a city that has been declared as a Smoke Control Area, you can select from a diverse range of Stovax fireplaces. Whether you are looking for a hearth mounted fireplace or a fireplace that will fit in a standard 22″ British opening, there are several sizes and styles to select from. A property with a non-exempt appliance may burn logs, by installing a Smoke Control Kit in their fireplace. Further, there is also a list of smokeless fuels approved by DEFRA that you can use in your non-exempt appliance. Speak to your Stovax retailer to find out more. By visiting the DEFRA website, you will be able to find out more information about Smoke Control Areas.